Attention Book Clubs and Discussion Groups! It’s here! We’ve developed our first version of a downloadable Discussion Guide to help facilitate conversations about Dr. Lally’s new book, For Our Babies: Ending the Invisible Neglect of America’s Infants. The book is a call to action to promote healthier development of babies in the U.S. It’s available in paperback and Kindle edition (on Amazon.com). The Discussion Guide includes questions and activities to jump-start conversation as well as information on how you might form a group if you don’t already have one. The Discussion Guide references the For Our Babies informational flyer page 2 “Get Involved” and is attached here. The two documents can be used together. Ideally, groups will come together to discuss and generate ideas about how to promote healthy development for babies in the United States. We’ll be collecting pictures and stories (via email followus@forourbabies.org) about For Our Babies’ book discussion groups to share on our website. Please note that this first version of the Discussion Guide is meant to be added to as discussion groups send us feedback with their ideas for additional discussion questions and activities. In other words, this is the seedling of a live document that we hope will grow with input from advocates for babies including you! Please email us at followus@forourbabies.org if you (and or your book group) are interested in participating and interacting with the For Our Babies campaign. The first five book clubs that responded to our call for groups are located in Mountain View, CA, New York, NY, Denver, CO, Phoenix, AZ and Tuscon, AZ. These five groups will each have their own private Q & A session with Dr. Lally via Skype! We can’t wait to see how they go! 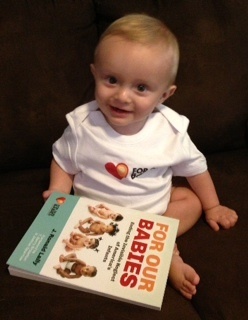 Our plan is to host more live Q & A sessions with Dr. Lally, so please write to us at followus@forourbabies.org if you (and perhaps your book group) want to get involved in this exciting and evolving discussion about For Our Babies: Ending the Invisible Neglect of America’s Infants. Remember everyone is invited to read and discuss this book. We hope you’ll join the discussion. We’re truly looking forward to your participation and ideas. This entry was posted in Home, Resources & Downloads and tagged Book Club. Bookmark the permalink. Trackbacks are closed, but you can post a comment.